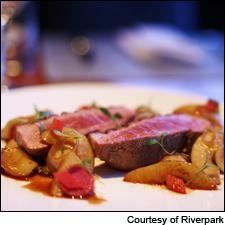 Sweet, savory, tangy and earthy flavors come together in this duck breast dish. With less than a week to go before Valentine's day, if you're entertaining your sweetheart at home, it's time to get planning. We've asked two New York chefs to share recipes that skip the usual (and often dubious) romantic/aphrodisiac clichés while still delivering the kind of mood-setting pleasure you seek on this lovers' holiday. Frank Prisinzano, chef and owner of four downtown restaurants (Sauce, Wine Spectator Award-winning Frank, Supper and Lil Frankie's Pizza), has shared his recipe for porcini mushroom ravioli, whose soft texture and earthy flavor calls out for the contrasting red fruit and spice provided by the Italian reds listed below. Straightforward, easy drinkability is the key to a great match here; save your brawny, highly-structured reds for another occasion. You may want to start with the pasta, or primi, then lead into the secondo, a duck breast recipe from chef and partner Sisha Ortúzar of Riverpark, an elegant two-year-old venture on Manhattan's east side that's co-owned by Tom Colicchio. The dish, which is a case study in the thoughtful balance of acidity, sweetness, earthiness, spice and herbal notes, finds its flavors harmonized nicely by the wines below, and smooth tannins help maintain the balance. Should you want to make dessert, continue the Italian theme with chef Gina DePalma's walnut tart with Port zabaglione cream, or make your own chocolate truffles—they're easier than you might expect, and it is Valentine's Day, after all. Note: This recipe serves four to six. If you're cooking for two, freeze the extra ravioli in a single layer, and once they're frozen solid, transfer to an airtight plastic bag. They will keep in the freezer for up to four weeks. Place the flour on a wood or stone table, or in a very large stainless steel bowl, and make a well in the center. Crack the eggs into the well and add the salt. Mix the eggs in the well with a fork until they start to thicken from the flour, then start to use your hands to knead the dough. If it's too wet and sticky, add a bit more flour. If it's too dry and doesn't hold together, sprinkle in a little water. Knead the dough until smooth, then wrap in plastic wrap and refrigerate for two hours. 1. Place the mushrooms in a bowl and add warm water to cover. Let soak for about 15 minutes, or until soft. Drain the mushrooms, reserving the soaking liquid. Puree the mushrooms in a blender or food processor, adding the soaking water teaspoon by teaspoon until you have a smooth paste. You will have to occasionally scrape down the sides of the food processor bowl or blender pitcher. 2. Place the the potatoes in a saucepan and cover by 1 inch with water. Bring to a boil and cook until very soft. Drain and transfer the hot potatoes to the bowl of an electric mixer fitted with the paddle attachment. Run the mixer on its on the slowest speed, and slowly add the milk, cream, oil, cheese and mushroom puree. Season to taste with salt and pepper. (You may also run the hot potatoes through a ricer, then fold in the milk, cream, oil, cheese and salt and pepper to taste.) Transfer the mixture to a pastry piping bag with a large tip, or a clean plastic storage bag with one bottom corner snipped. 3. Roll the pasta dough through a pasta-rolling machine, starting with the widest setting and working down to the second-narrowest setting. Lay two equal-sized sheets out on a well-floured cutting board or work surface, side by side. Crack the egg into a small bowl, add about 1/2 tablespoon of water and beat it well with a fork. Use a pastry brush to egg wash one of the sheets of pasta, then evenly pipe out dollops of the porcini potato filling. 4. Place the second sheet of pasta atop the egg-washed sheet and use a knife or pastry cutter to cut the ravioli into whatever shape you prefer. Pick up each raviolo and use your fingers to seal all around the filling. Repeat the procedure with the remaining pasta dough and filling. Place the finished ravioli onto a baking sheet that is covered completely in semolina flour. Sprinkle a bit more semolina atop the ravioli and refrigerate until you are ready to cook them. 1. Fill a large pot with water, season it aggressively with salt and bring it to a boil. 2. In a large sauté pan, melt the butter over medium-high heat until it foams, subsides and browns. Add the sage and remove it from the heat. 3. Add the ravioli to the boiling water and cook until they are all floating. Remove the ravioli with a skimmer or slotted spoon and add them to the pan with the butter. Return the pan to the stovetop and, using a ladle, add a few splashes of the pasta cooking water. Agitate the pan and bring the mixture to a boil. Cook for about 1 minute, then remove from the heat and serve immediately, on plates or in shallow bowls, garnished with the Parmigiano-Reggiano. Serves 4 to 6. 1. Heat the oven to 375° F. Place the duck breasts, skin-side up, on a cutting board. Using a sharp knife, make crosshatch incisions just through the layer of fat, being careful not to cut into the meat. 2. Heat a skillet over medium heat. Season both sides of the duck with salt and the cayenne pepper, then add the duck to the skillet, skin-side down. Cook the breasts until the skins are crisp and the fat is mostly rendered, about 5 minutes. Turn the breasts, add the butter and thyme to the skillet, then baste continuously for about a minute more. 3. Drain the duck fat from the pan and remove the thyme. Transfer the skillet to the oven to roast the breasts: 5 minutes for medium-rare, 8 minutes for medium. Using tongs, gently transfer the breasts to a roasting rack and allow them to rest for 5 to 10 minutes before slicing. 4. Meanwhile, add the turnips to the hot skillet and pan-roast them over medium heat until nicely browned on all sides. Add the shallots and poached pears and sauté until they begin to brown as well. Deglaze the pan with the Port first, until reduced, then add the demi-glace and continue cooking until the pan sauce is reduced but still fairly loose (and not yet to a syrup-like consistency). Finish with the lime juice, lime zest and cilantro. Season to taste with salt. 5. To serve, distribute the turnips and pears equally onto four plates. Slice the duck breasts and arrange one onto each plate over the turnips and pears. Garnish each plate with some sliced radish and a few cilantro leaves. Serves 2. Using a square of cheesecloth and a piece of clean string, make a bouquet garni for the thyme, coriander seeds and star anise. Place it in a saucepan, along with the wine, sugar, thyme, coriander seeds and star anise and bring the ingredients to a boil. Reduce the heat to a simmer, add the pears and cook until very tender, about 6 minutes. Remove the pears from the liquid and let cool, then refrigerate until ready to use. Note: The following list is a selection of outstanding and very good wines from recently rated releases. More wines can be found in our Wine Ratings Search. Black currant, bilberry, violet and spice flavors align in this luscious red, which is well-balanced and integrated, with a lingering aftertaste of sweet fruit and spices. Sangiovese, Cabernet Sauvignon, Merlot and Syrah. Drink now through 2018. 54,000 cases made.—B.S. Dark, rich and polished, with racy cassis, plum sauce and raspberry ganache notes woven with fine tannins and hints of spice, licorice and ash. The fruit returns for an encore on the finish. Drink now through 2015. 40,000 cases made.—N.W. This red has mellowed to a burnished glow of cherry, plum and oak spice flavors, all in harmony. There are still some tannins on the finish, but they are integrated and this shows class and complexity. Drink now through 2018. 19,166 cases made.—B.S. A plush, charming version, featuring cherry and chocolate aromas and flavors tinged with spice. The tannins are well-integrated on the long finish. Best from 2013 through 2020. 25,000 cases made.—B.S. Cherry, tar and mild chocolate flavors grace this smooth, generous red. Firms up on the finish, where fruit and spice notes linger. Drink now through 2016. 25,000 cases made.—B.S. A bright, fruit-driven style, exhibiting cherry and boysenberry flavors tinged with spice. Medium-bodied, with a hint of bitter almond on the finish. Best from 2013 through 2018. 12,500 cases made.—B.S. A supple, juicy red, with blackberry, black cherry and sweet spice flavors. Balanced, with a touch of milk chocolate on the finish. Best from 2013 through 2020. 125,000 cases made.—B.S. This red is on the soft side, displaying cherry, raspberry and spice flavors. Backed by light tannins, with a hint of tobacco on the finish. Drink now through 2015. 25,000 cases made.—B.S. Attractive cherry, raspberry, violet and spice aromas and flavors mark this juicy red. A touch of black pepper graces the finish. Drink now. 125,000 cases made.—B.S. A ripe, round red, featuring dark layers of candied cherry, plum reduction, licorice and milk chocolate, with medium tannins adding weight to the finish. Drink now. 15,000 cases imported.—N.W. A bright red with cherry and raspberry flavors, this is focused on the fruit. Light tannins hold the finish. Drink now through 2015. 10,000 cases imported.—B.S. This bright, cherry-flavored red offers a soft texture and light tannins. The pleasantly astringent finish is cleansing. Drink now through 2015. 62,500 cases made.—B.S. Rich and fruity, offering black cherry, blackberry and floral notes, with a hint of black pepper. The vibrant structure maintains focus. Sangiovese, Cabernet Sauvignon and Merlot. Drink now. 6,000 cases imported.—B.S. This is a very conflicted recipe to me...a lot of pulling to red wine, and then, to white wine...depending on the ingredient. In this complex position I would normally serve a mild merlot (Columbia Crest H3) or a fantastic white, like a Sigalas Santorini...sorry if I mispelled anything.